[A]n impressive 72% of Americans express a "great deal" or "quite a lot" of confidence in the military. A similarly high 70% express that confidence in small business, and 57% maintain the same confidence in our nation's police. It's been a difficult week for Al Gore. Its tragicomic quality was amplified because it was supposed to be a lustrous one with the debut of "An Inconvenient Sequel," the followup to his 2006 jeremiad "An Inconvenient Truth." But then investigative journalist Drew Johnson of the National Center for Public Policy Research intervened. According to Johnson's research, last year Gore consumed 21 times more energy to power his mansion than the average American. Analyzing data obtained via public record requests and discussions with Nashville Electric Service (NES) officials, Johnson found that Gore used an average of 19,241 kilowatt hours (kWh) of energy each month over the past year, compared to the U.S. household average of just 901 kWh. In fact, Gore used 66,159 kWh over the past year just to heat his pool. That's enough to power six average American households for 12 months. 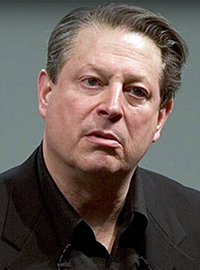 In February 2007, the day after his panicky global warming film "An Inconvenient Truth" won an Academy Award for Best Documentary, a shocking report based on public records revealed that Al Gore's Nashville home consumed 20 times more electricity than the average American household. Facing scrutiny for his extreme electricity consumption, the former vice president pledged to renovate his home to become greener and more energy-efficient. The extensive and expensive overhaul of Gore's house included installing solar panels and geothermal heating. Gore spent a reported $60,000 to install 33 solar panels to change his hypocritical ways. Ten years later, however, they account for just 1,000 kWh per month, or a paltry 5.7% of his consumption. Moreover, that was just Gore's Nashville, Tennessee, mansion. He also owns two homes in San Francisco, as well as a farmhouse in Carthage, Tennessee. Lest one assume that Gore is simply an outlier in the hypocrisy department, a new survey from YouGov suggests that he's actually representative of climate bien pensants more generally. According to the poll, just 9% of respondents who believe in anthropomorphic (i.e., human-caused) climate change said they've reduced fossil fuel consumption "a lot" since adopting that viewpoint, whereas 54% said they haven't changed their consumption at all. Additionally, only 13% said they've reduced their red meat consumption (which allegedly accounts for more greenhouse gas emission each year than all of the earth's automobiles combined), while 66% said they've not changed their consumption at all. When global warming alarmists don't practice what they preach, it obviously suggests that it isn't the crisis they claim, and that they're more concerned about virtue signaling or making a buck. That dissonance might also explain Gore's second humiliation of the week. "An Inconvenient Sequel" placed 15th in box office receipts following its release, and earned lukewarm reviews from audiences. Paramount apparently couldn't be bothered to aggressively promote An Inconvenient Sequel as the movie Trump and Scott Pruitt didn't want you to see - and giving American audiences a decent chance to see it. By failing to do so, the studio effectively undercut its own product. Sadly, the box-office underperformance of An Inconvenient Sequel will be seized upon by climate-change deniers as "proof" that Americans don't really care about this issue. Interesting theory. At least he didn't blame Russia-Trump collusion, so perhaps that constitutes progress. The more likely explanation for the film's flop is that people have now endured a quarter century of Gore crying wolf, and tuned him out. The world is once again at a critical juncture. We are invading ourselves and attacking the ecological system of which we are a part. As a result, we now face the prospect of a kind of global civil war between those who refuse to consider the consequences of civilization's relentless advance and those who refuse to be silent partners in the destruction. The time has come to make this struggle the central organizing principle of world civilization. One suspects that as long as there's money to be made and international acclaim to be milked, we'll probably always remain at that same "critical juncture." Regardless, Gore asserted a decade ago that, "The only way to solve this crisis is for individuals to make changes in their own lives." The fact that he refuses to make those same changes suggests that even he doesn't consider it a legitimate crisis at all.